France is where the idea of luxury barge cruises first started, due in no small part to the myriad of waterways which cross not only its scenic countryside, but also many of its historic towns and cities. And while a Burgundy barge cruise may not be one of the best known holiday options for visitors to France, those who do discover hotel barging in Burgundy are sure not to be disappointed. In fact, taking a Burgundy barge cruise down one of the region’s canals is a truly wonderful experience. The area boasts some of the world’s finest wines with around 60,000 acres of sunlit vines and arguably the prettiest canals in France. The waterways wind through the heart of the territory’s renowned vineyards, medieval towns, elegant châteaux, magnificent cathedrals, picturesque villages and wonderful local markets. En route, barging in Burgundy guarantees our clients a wealth of sightseeing opportunities. This is a region with a vast variety of cheeses, in all shapes, sizes and colours, strong in character or mild and fresh and all can be enjoyed with full-bodied red Burgundies, or perhaps with lighter white Chablis wines. The Burgundian gastronomic tradition is rich and diverse and a sedate Burgundy barge cruise along one of its delightful waterways will allow you to indulge along the way in good food and wine: two of life’s essential pleasures. Please note: Family, Golf, Wine Appreciation Theme Departures available. Please contact us for more details. The ‘Renaissance mood’ extends to the four very generously-sized twin or double bedded bedroom suites, (approx. 265sq ft including en suite), each one fully air-conditioned and complemented by a large en suite bathroom. Guests are met at our meeting point in Paris** and transferred by private chauffeured minibus to the spacious Renaissance where a Champagne welcome with canapés awaits you and you meet the Captain and crew. Time enough for a walking tour of the pretty village of Montargis before dinner on board. 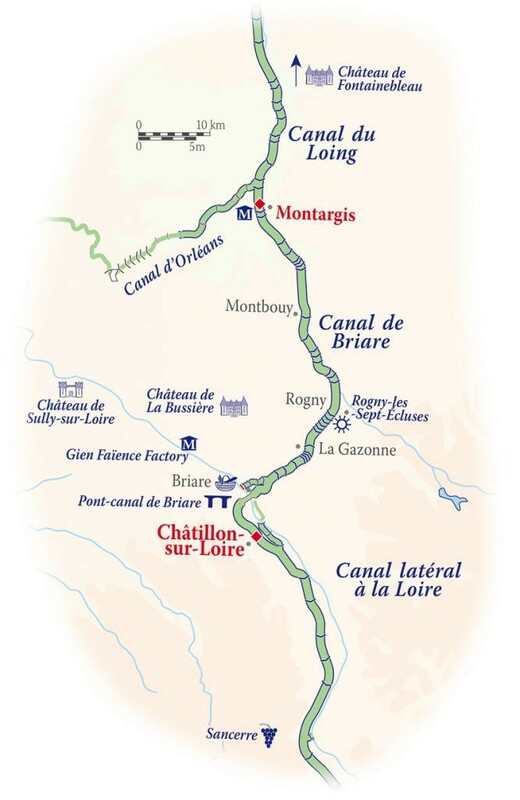 This morning, we embark on our first cruise through the Loire countryside, with great towpath walking and cycling opportunities, to moor at Montbouy. After lunch on board, we visit the Château de Fontainebleau, a national museum and UNESCO World Heritage Site where we enjoy a behind the scenes tour of the French Military School of Horse-riding, accompanied by a passionate French Colonel. We continue our tour through the magnificent château itself; the only royal and imperial residence to have been continuously inhabited for seven centuries, to walk the halls of Fontainebleau is to stroll through the history of France. Dinner on board. This morning we visit the privately-owned Château de La Bussière, known as the ‘fishermen’s castle’, with its wonderful ornamental and vegetable gardens. Following lunch back on board, we enjoy an afternoon cruise to our mooring at the pretty village of Rogny-les-Sept-Ecluses, near its 350-year-old 7 lock-flight, which is well worth visiting on foot. Dinner on board. After a leisurely breakfast of fresh croissants, baguettes and assorted pastries we visit Gien, home of the Faience pottery, renowned for its beautifully decorated and vibrant dinnerware, and also explore the town’s bustling market. After lunch, we enjoy an afternoon cruise to La Gazonne, a beautiful mooring surrounded by lakes and ponds that provide water for the workings of the Canal de Briare. Dinner ashore at the Michelin-starred Auberge des Templiers in Les Bezards. A morning cruise to our mooring at the little town of Briare, site of Gustave Eiffel’s magical aqueduct across the River Loire, again with excellent walking and bicycling opportunities. We preview Friday’s crossing of this amazing 10,000 ton, 662 metre Pont Canal which was completed in September 1896. Our afternoon visit is to a renowned winery in Sancerre, such as Domaine Henri Bourgeois in Chavignol, for a tour and private tasting. This medieval hilltop village overlooks a vibrant region which has known viticulture since Roman times. Dinner on board. This morning we wander around fruit and vegetable, seafood, cheese and French fashion stalls in the market in Briare before returning to the hotel barge for a short cruise across the aqueduct and lunch on board. This afternoon, we visit the delightful Château de Ratilly and its rather spectacular selection of turreted towers, construction of which began in 1270! Captain’s Farewell Dinner on board. After breakfast, guests are transferred by private chauffeured minibus to Paris. Renaissance has been designed to carry her guests in ultimate luxury along the Canal de Briare, France’s oldest canal and steeped in history on a cruise route that features elegant chateaux, small countryside villages and the famed wine-growing region of Sancerre. She is a very spacious hotel barge and the beautifully-appointed saloon with its wooden beams, classic dining furniture and artworks, invokes the atmosphere of a classic French manor house. The comfortable leather sofas and hand-built bar where you can enjoy your pre-dinner aperitif, add to the feeling of onboard opulence. Outside, the large forward deck includes a covered roof extension with a circular table for alfresco dining, comfortable hardwood sun loungers and a heated spa pool. With her refined onboard ambience, Renaissance is the perfect vessel on which to cruise a historic canal and experience the splendour of landmarks en route, including Gustav’s Eiffels’s aqueduct across the mighty River Loire. France is where the idea of luxury barge cruises first started, due in no small part to the myriad of waterways which cross not only its scenic countryside, but also ......click here to read more.